You were wearing a helmet. That’s it. That is the only singular thing that you did right. I am sure that you don’t remember me. You passed me today on 1-4, on the right. We were in the first two right lanes. Traffic was merging in and out. I was driving at about sixty-five so I estimate that you were driving at about ninety miles per hour. You were weaving in and out of traffic. When I saw you get off on the exit ramp up ahead of me, on the left, I watched you weaving your bike back and fourth restlessly as the traffic backed up ahead of you. You were wearing a t-shirt and tennis shoes. You didn’t have on boots or a stitch of leather. I wonder if you have ever imagined what would happen to you if you made that one wrong move that caused you to crash, or if another driver did. Pavement shreds unprotected skin off of the human body at high speeds in the same way that a grater works through soft cheese. A motorcycle provides you no protection against any element on the road. My friend Dan is a really great guy, and he is a wonderful motorcycle driver. He adores his bike. He always wears full leather and a helmet. He never drinks before driving his motorcycle. He uses signals. He takes the opportunity to inform people as often as possible how dangerous driving a motorcycle is. 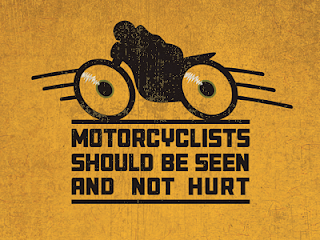 He tries to encourage car drivers to be on the lookout for motorcycles. He reminds them to give bikers space and explains why it takes a motorcycle so much more distance to come to a stop than a car. He respects motorcycles. When I was a kid a family in my town lost their eldest son in a motorcycle accident. They had seven kids. He was the oldest beloved brother. He was eighteen with plans for college. He was a wonderful young man. He was riding his motorcycle safely when a car ran a red light and hit him. He flew into a telephone pole and his neck was instantly broken. His family was so deeply damaged because of his loss; I cannot begin to explain it. They were never the same again. I am not your mother. You made me very upset today. I do not want to see your body smeared across the pavement on I-4. I do not know how I would live with myself if I were involved in an accident where you lost your life, even knowing you were the one who caused it. I do not know if you have a lack of value for your health or your life. I do. I want you to have some respect for yourself, some consideration. I do not want for you to die, and I do not want for you to cause of death of someone else. Please…please drive safely.